The Bench trail is a backcountry route that is located in the Colorado National Monument near Grand Junction, Colorado. On its south end the trail begins off of the Liberty Cap trail where it travels along a bench that was created as the softer layers of sandstone eroded away above a much harder layer of dark precambrian granite. 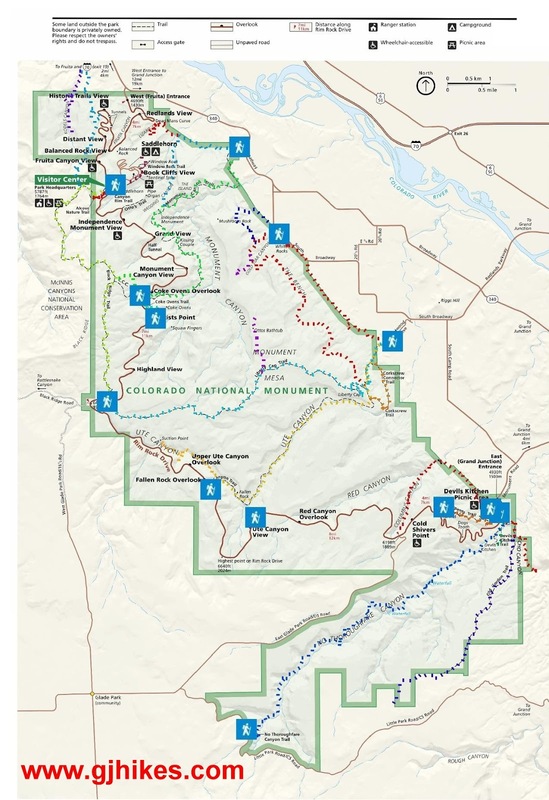 After a little more than 3 miles the trail reaches Gold Star Canyon where there are several options available for descending off of the bench to the White Rocks Area trailhead. From there it is possible to loop back to the Wildwood trailhead by following a social trail along the old buffalo fence that outlines much of the Monument's eastern border. For this post we left a vehicle at the Gold Star Canyon/White Rocks trailhead and had someone drop us off at the Wildwood trailhead on Wildwood Drive. If you ask Google for directions it can get you to both trailheads. To get to the Bench trail follow the Liberty Cap trail as it climbs to get above the black ribbon of the precambrian formation. Near the 1 mile point it passes the spot where the Ute Canyon trail branches off on the left and within another tenth or two of a mile it reaches the beginning of the Bench trail. At present there isn't a sign for the trail so keep your eyes peeled for a small cairn. Even though the trail doesn't show up on the official map for the Monument the Park Rangers have lead tours on it in the past. The trail is shown on the kiosk for the White Rocks Area but not on the map at the Wildwood trailhead. The trail starts out very faint at first but within a short distance the well worn path becomes much more apparent and easy to follow. For its entire length the trail traverses around the outline of the cliffs turning inward to get around the drainage in each side canyon that it comes to. On this trip we noticed fresh bighorn sheep tracks as we left the Liberty Cap trail. As we hiked we kept looking everywhere we thought they might be. To our surprise and delight we came upon where they were grazing after a mile or so. They were right in the middle of the trail so there was no missing them. We spent 10-15 minutes taking photos with the zoom lens until they eventually moved far enough off the trail that we could pass without causing them any undo stress. There were more than a dozen in this herd counting a handful of little baby lambs. Another thing to look for while hiking the Bench trail is a pretty good sized natural bridge that spans the lower part of a large alcove. Overall the Bench trail doesn't have much elevation change from one end to another. There are a few minor washes where the trail gets steeper for short distances. The greatest amount of effort is getting up to the bench from the valley floor and then getting back down on the other end. There is a fork in the trail as it comes around to Gold Star Canyon. On past trips we have always followed the route that travels around the drainage into Gold Star Canyon to get down to the trailhead. For this post we noticed that the other route seemed to be getting quite a bit of use so we decided to give it a try. This route drops off the bench right above the sandstone hill that is known as White Rocks. Like the more traditional route there are places that get pretty steep and have a layer of scree that borders on treacherous at times. Taking the White Rocks route allows one to check on the petroglyphs that are there. Be sure to treat them respectfully by not touching them or harming them in any other manner. From White Rocks it is only 1 or 2 hundred yards to the trailhead. If you decide to complete the entire loop it is about 3 miles of easy hiking along the border of the Monument between the two trailheads. 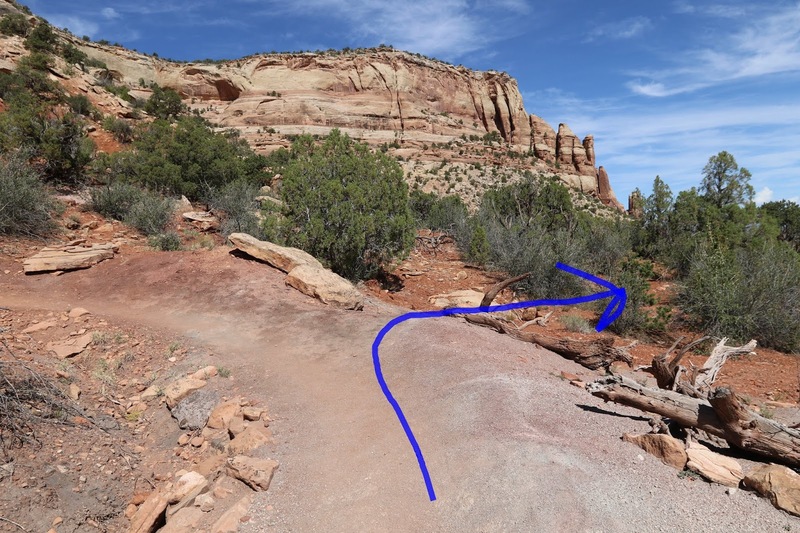 The Bench trail is one of our favorite hikes in the Colorado National Monument. It doesn't get as much use as some of the more well known trails and rather than hike it from one end to the other most people seem to just go until they feel like turning around. On older maps the Bench trail is actually just a segment of on old Ute trail that traveled around the east and north borders of what is now the Monument and continued west toward Mee Canyon. If you would like to see it for yourself then all you have to do is 'Take a hike'.